Comprehensive design can transform any outdoor space into a personal paradise. Most pool designers agree that a certain level of intrigue is necessary to foster a feeling of full immersion in a pool-centric landscape. Primary and tertiary spaces, peek-a-boo views, focal points, quiet zones, active areas—all help to create what can properly be called an outdoor oasis. No matter the scale, the incorporation of certain key features into a thoughtful design can transform a backyard pool into an experience far beyond the conventional. For James Scott of Group Works LLC in Connecticut, creating that experience requires a landscape architect’s lens. By viewing the pool as a water feature within the landscape, he is able to consider the whole picture, giving no more weight to the pool than to all that surrounds and supports it. “It’s not that I am trying to fit the landscape around the pool, but more that I am trying to understand and determine how a pool or watershape is best suited to the goals, but always with the land and the new landscape in mind,” he explains. For a home on the east side of the Hudson River, the client requested a negative-edge pool, which Scott believes works well with the wooded setting, outlying hills, and the roll of land down to a meadow below and the town of Cold Spring beyond. “The idea was that once you got to the pool area, anything beyond it would be let go [into the natural landscape],” notes Scott. Key to the success of this design was Scott’s determination to capitalize on the topography. “Working with the grade means working with the character of the land and the surroundings,” he says. The effect in this case is one of continually stepping down—guests step from the house to a furnished deck, down to the upper pool deck, and down again to the lower pool deck. Then the land continues to step down and roll off. The property’s multilevel layout resulted in five different “rooms.” “You get a lot of emotion when you create different areas,” says Scott, who believes that the time of day and the season expand the breadth of those emotions. Unique Landscapes & Custom Pools’ Chris Griffin points to a custom-built home in Scottsdale, Arizona, as a solid example of an outdoor oasis. The client came to him with a full list of requirements that included shaded areas, a spa, swim-up bar, and a negative-edge pool situated such that it would bleed into the hilltop landscape. Working with those parameters, Griffin approached the project—challenging for its exposed location in such a vast landscape—by first determining the siting of features based on the house layout, views, and pedestrian circulation. Conversely, he used certain features to block nuisance views. For example, by strategically locating the fireplace wall with TV, he blotted out the client’s view of neighboring lots from both patios. Additionally, to create shade as well as a smooth transition from the family room into the outdoor space, he extended the house to cantilever over the spa. The poolscape cascades from the house down into the natural environs—an effect enhanced by disappearing negative edges on the spa and pool. The illusion shows the spa spilling into the pool and the pool overflowing into the landscape. For a truly dynamic pool-centric setting, Griffin feels a healthy budget is key as it allows for the inclusion of unique features. Furthermore, he says it helps to have clients willing to take a chance on some design ideas intended to make the project something special. Brad Stephens, owner of Houston-based Backyard Amenities, thinks in terms of tropical appeal and primary and secondary focal points. He explains, “My idea of an outdoor oasis is a tropical lazy river, palm trees, rock formations, and a natural type of pool.” He stays abreast of trends and is including more columns, fire and water bowls, and glass tile spas with perimeter overflows in his designs. “Travertine and glass tile are very popular these days,” he adds. Spatial limitations are something he comes up against. “The biggest challenge today is a small yard with big easements—trying to design something that meets the customer’s needs with very little space in which to do the work. Everybody has a big list of wants,” he says. To meet those demands, Stephens gives careful thought to the role a pool plays in a client’s lifestyle—whether its function is for exercise, family time, or ornamentation. He feels that a client’s ability to clearly articulate desires determines a project’s level of success—that being the creation of an oasis, not simply a pool. 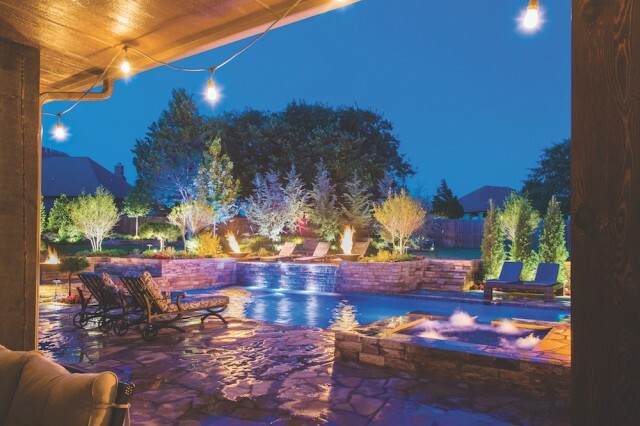 Kelly Caviness of Oklahoma’s Caviness Landscape Design, Inc., looks for ways to create layers of interest in a poolscape. “You are taking in everything from every angle so it’s not a cookie-cutter swimming pool,” he says. Designing for compact spaces is a matter of prioritizing and working in an appropriate scale, he says. “You can have all the features with the same impact but they need to fit the site without overwhelming it,” he explains. “You have to find what really looks like a fit.” If a site is challenging for its steep grades, he looks for terracing opportunities, for example. No matter the obstacle, the result should evoke a strong positive reaction. “An oasis should make people say ‘Wow!’—that should be the first thing that comes out of their mouth. If you can pull that off, you have accomplished the goal,” says Caviness. The use of regional quarried stone gives his projects a signature look. “There are quarries everywhere here,” he notes. “It’s about picking a color and looking at the way the grain runs, whether it’s a long-lasting stone or conducive to doing dry walls.” Caviness sources the stone and does a lot of the chiseling in-house. “The farther east in Arkansas you go, the denser the stone, which makes it conducive to underwater uses. Knowing those kinds of things really helps inform our design choices,” he says. Whether facing a compact space, a sprawling piece of flat land, a lengthy list of client likes and dislikes, or a challenging climate, these designers are able to go beyond the pool to create an experiential poolscape and, even better, an indulgent outdoor oasis.